Smithers Pira identifies the key radiation technology developments that are boosting productivity in the radiation curing print market. According to The Future of Radiation Curing Print Markets to 2022, print produced using radiation curing (UV and electron beam) inks and varnishes in 2017 totalled roughly 1.38 trillion A4 prints, a value of $63.4 billion. The market is growing at around 2-3% annually in tonnage terms. With ink revenues growing faster than the overall graphics and packaging market, users are taking advantage of instant drying to improve their production efficiencies and exploit both decorative and functional properties of the inks and coatings. Radiation curing not only saves time by instant drying but it also enables various efficiencies across a wider production process. While print volumes in graphics generally is falling by 3.0% per year between 2012 and 2022, the radiation curing print segments of this, and the still booming packaging market, are poised to expand market share. Radiation curing volume will grow by 25.0% by volume and 33.6% in value terms across this period. Smithers Pira identifies the key developments in ink and varnish formulation and curing technologies that are underpinning this expansion. UV curing methods are changing. The majority of ultraviolet drying in 2017 is still carried out using mercury vapour quartz lamps, but these take time to warm up and there are potential health and environmental hazards at end-of-life. These limitations are amplifying the benefits of low-energy curing. This curing system is designed to dry the print using much less energy than the traditional mercury vapour lamps, with a single mercury doped lamp. The system uses special inks that command a premium over the traditional UV curing inks and varnishes. These lamps do not emit the shorter UV wavelengths that generate ozone, removing the need for ozone extraction. They produce less waste heat, so require less cooling, which further reduces the power consumption. The technology is now being taken up in North America and Europe. Low-energy curing can be used on perfecting presses with two lamps to dry each side, and Komori has commercial web presses using H-UV technology instead of a hot air oven, thus reducing the press footprint – which is important in its home market of Japan, where the very high cost real estate make space saving potentially a significant cost advantage. UV LED curing uses light-emitting diodes that emit a narrow band of UV, delivering a peak of UV energy, which provide a broad distribution of output across the spectrum, including visible and infrared. LED curing offers even less energy than the low-energy mercury bulb UV systems, and there is an instant on-off, which can reduce further the downtime required in waiting for the lamps to come to full power, as well as providing significant energy savings through synchronisation of cure with ink laydown. The drawback is limited availability of suitable inks, and the high cost premium currently associated with them. The range of UV LEDs commercially available is growing, shadowing LEDs wider use in general lighting installations. Printers that are already using UV LED are reporting energy consumption as much as 70% lower than conventional UV systems. Another attraction of UV LED systems is their colour brilliance, stemming from higher pigment content. UV LED is moving beyond niche applications into higher-volume segments in some European countries, such as sheetfed printing, where the technology has the advantage of being able to provide high colour strength. Electron beam curing uses a high-powered electron beam to initiate the free radical polymerisation reaction. A curtain of accelerated electrons is emitted towards the printed surface, in an evacuated chamber. The energetic electrons pass through a titanium window foil towards the wet ink, the energy is absorbed by the ink layer and the curing process takes place. The benefit of the technology is the penetration of electrons into the body of the inkfilm, rather than just at the surface, ensuring good through-curing. It is widely used in the Americas on wide web presses, but less so in Europe. There are developments to broaden its use through lower-cost and smaller EB curing units, including for the first sheetfed processes, and ink technology to broaden the use on flexo and gravure presses. The proportion of electron beam in radiation curing remains low, at just 4–5% in 2017, with most in North America and lower elsewhere. As radiation curing is widely used in food, pharmaceutical and tobacco packaging, it is important that no components can migrate from the print into the product and cause any organoleptic effects. This is particularly important in tobacco packaging, where the criteria for odour-free and migration-proof packaging are driven by the fact that tobacco is hygroscopic. Odour and taint are potential issues for all converters. Ink manufacturers are formulating low-migration inks using selected components, which should ensure that migration from the resultant printing ink film will be within accepted migration limits. Ink formulators may choose components from the known range of approved ingredients, or choose the new classes of materials becoming available that offer inherently lower potential contamination. This issue is now being approached via new legislation announced in 2017 in the EU, and other markets like Japan. Several ink manufacturers are exploring new methods of formulating inks to broaden the range of applications for UV and electron beam inks and to improve their performance on press. In flexible packaging on common impression flexo presses there is limited space for interdeck drying, and ink manufacturers are developing UV and EB curing inks with water or solvents. These act as diluents, and there is a degree of evaporation at the print stage that enables improved wet-on-wet trapping. 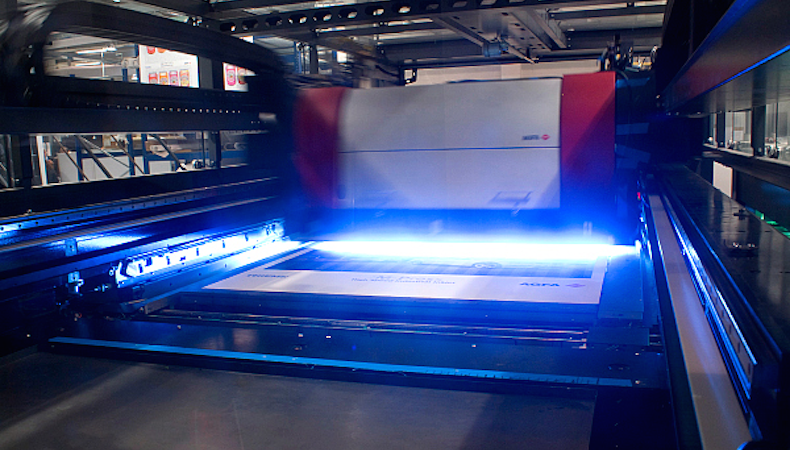 There are developments in water-based electron beam gravure printing, for example IdeOn at Amgraph Packaging in Connecticut uses water as a diluent for electron beam-curable gravure inks. A significant advantage of these hybrid inks is that they are not classified as hazardous materials, which traditional 100% solid UV inks and coatings are. This means manufacturers do not have to apply a hazardous chemical label onto the pack, and they can be transported in bulk – whereas a UV ink categorised as hazardous cannot be transported in a container larger than 25 litres. The Future of Radiation Curing Print Markets to 2022 provides quantitative market sizes for the major technologies in radiation curing globally, forecasting the markets to 2022 by curing, method print process, and end use application. For more information, download the brochure here. Come and see the latest UV-LED printers in action and pick up some samples at FESPA Global Print Expo, which is taking place from 15-18 May at the Messe Berlin in Germany. To register for the event, view an up-to-date floorplan and find out more about the various special features that will run at FESPA 2018, click here to visit the event’s official website.